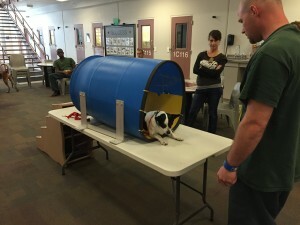 On October 14, October 28, and November 19, CPT President and Head Trainer Mark Spivak visited the Gwinnett Jail to instruct prisoners on proper dog training techniques to better prepare rescue dogs for adoption into permanent homes and for participation in the Office of Naval Research (ONR) sponsored CPT/Emory fMRI projects. 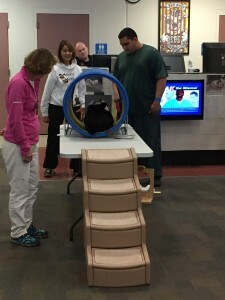 Society of Humane Friends volunteers Diana and Laurel Ann observe as a Jaildogs inmate teaches Sonja to perform a down-stay within a mock MRI bore and head coil. 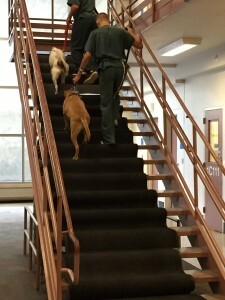 The Gwinnett Jaildogs program, formally called Operation Second Chance, is a partnership between the Gwinnett County Sheriff’s Department and the Society of Humane Friends of Georgia. The genesis occurred as Gwinnett Sheriff Butch Conway became increasingly appalled at the high number of dogs euthanized in the county. Consequently, Sheriff Conway developed the program in February 2010 as a resource for concurrently saving the lives of abandoned animals and improving the lives of Gwinnett Jail inmates. The process begins when the Society of Humane Friends of Georgia pulls dogs from the euthanasia line at Gwinnett County Animal Control and brings them to the jail. Once at the jail each dog is placed with a primary and secondary inmate who collaborate to feed, groom, and train the dog. 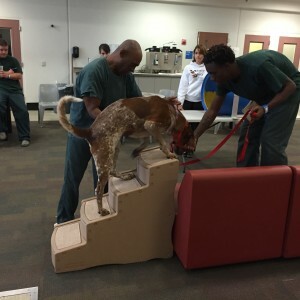 The prisoners are screened and specially selected for inclusion in the Jaildogs unit, as participation is considered a privilege and is in high demand amongst inmates. 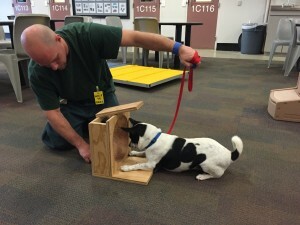 During the training period the program dogs live with the assigned inmates 24/7. Then, once the dogs are prepared to a satisfactory level, they are made available for adoption through the Society of Humane Friends. 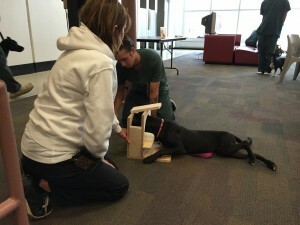 CPT Trainer Mark Spivak, along with volunteers from the Society of Humane Friends, educates the inmates how to instruct their dogs in both basic obedience and MRI-specific behaviors. 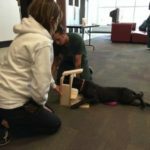 The goals is to both improve the adoptability of the dogs and to prepare the dogs to participate in fMRI projects that provide knowledge regarding canine cognition, emotions, sensory reception, receptive communication, and inhibitory control. 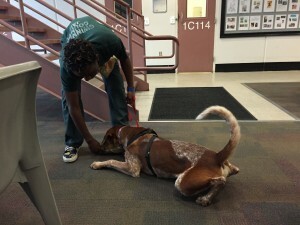 Here an inmate teaches Clifford how to perform a down from a standing position. The fortunate dogs receive a second chance at life and obedience training that increases the probability of a future adoption. Meanwhile, the inmates learn social and vocational skills that will benefit them upon their release. 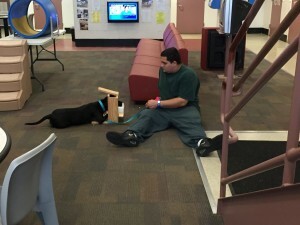 Moreover, the companionship of the animals improves the quality of life of the inmates, which is a major reason for the program’s popularity within the prison population. 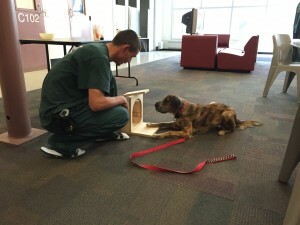 The program began experimentally with 5 dogs marked for euthanasia. 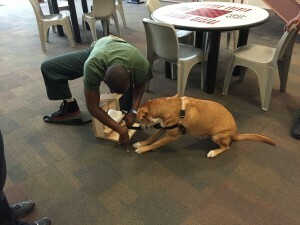 Success has enlarged the program, whereby Jaildogs now trains 15 dogs simultaneously and continuously introduces new dogs after existing dogs achieve adoption. Professional trainers, groomers, and veterinary technicians educate the inmates how to instruct and manage the dogs. 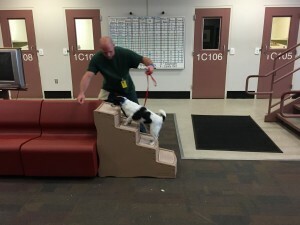 During their temporary residence at the jail, the dogs learn basic obedience, manners, tricks, and agility behaviors that increase the adoptability of the animals. Since its inception, Jaildogs has facilitated the adoption of over 200 dogs into permanent homes. Initially Shai was apprehensive about approaching the stairs. However, with a CPT designed systematic desensitization protocol and a motivated inmate trainer he was soon traversing the stairs like a champ. And in October 2013 Operation Second Chance expanded to include cats. 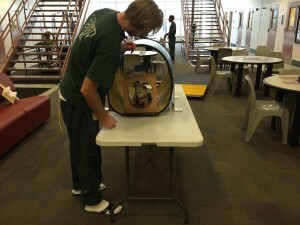 Jail Cats is housed within Unit 2D of the women’s section of the Gwinnett Jail. The Jail Cats program saves feline lives, teaches female inmates valuable life skills, and helps inmates to better cope with life both while in prison and, more importantly, upon their release. The Jaildogs and Jail Cats programs are maintained exclusively by volunteer labor and donor contributions. No dollars are allotted from the Gwinnett County budget. 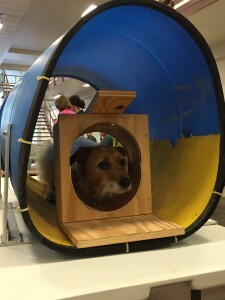 The Society of Humane Friends of Georgia provides necessary monies, selects the dogs and cats, manages the adoption paperwork and meetings, and schedules trainers and volunteers. Nevertheless, the program welcomes additional donor monies to provide food and veterinary services that maintain the health of the animals and additional professional training services that educate the inmates. If you wish to adopt an Operation Second Chance dog or cat or wish to contribute financially to the program, please contact the Society of Humane Friends via their website: www.sohfga.com. Initially, Cole was petrified of the stairwell and wouldn’t venture near the MRI steps. To overcome his fear, we had to carpet the stairs to block openings and use Sally as a model. 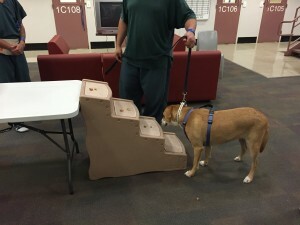 After two weeks of training he walked the stairs without the carpet or an accompanying dog. The desensitization training will improve Cole’s opportunity for adoption. 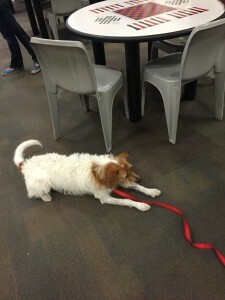 Sally performing a basic down-stay. Very cute!! Clifford’s primary and secondary handlers teach him to negotiate the MRI stairs. After mastering the jail stairs Cole gets ready to tackle the MRI stairs. Sheba calmly awaits during the early stages of learning to perform a down-stay within the coil. Cole still needs a hand signal and sometimes a food lure to complete a down from a standing position. But, he is improving. He is also improving at becoming more relaxed around unfamiliar objects, such as the coil. Society of Humane Friends volunteer Diana Delatour assists a prisoner in teaching Liz how to perform a down-stay inside a mock fMRI coil. Shai’s primary handler teaches him how to perform a down-stay in the coil. At first, Shai was uncertain about placing his head through the coil aperture. However, soon he confidently performed the behavior. Regardless of whether he qualifies for the MRI study, the MRI training will bolster his confidence and improve his obedience, which should increase the probability that he will become adopted into a permanent home. Shai learning to perform a down-stay within the MRI bore. Sonja performing an outstanding down-stay within the coil and chin rest! Sally performing an excellent down-stay within the mock MRI bore and head coil. Lady came to the Jaildogs program after suffering severe abuse from a prior owner. However, Jaildogs rescued her from euthanasia and has given her a second chance at life. Here she performs an excellent down-stay within the mock MRI bore and coil. She has come a long way since entering the program!